Farmworkers and their allies march 234 miles from Ft. Myers, FL, to the offices of the Florida Fruit and Vegetable Association in Orlando in 2000. Steve Hitov, the CIW’s longtime General Counsel, is pictured (beard, cap, and light blue shirt) in the upper lefthand corner of the picture, in conversation with CIW’s Co-founder Lucas Benitez. He was with the CIW during the general strikes of the 1990’s, securing the release of farmworker leaders from the Collier County Jail when they were wrongly arrested by overzealous sheriff’s deputies. 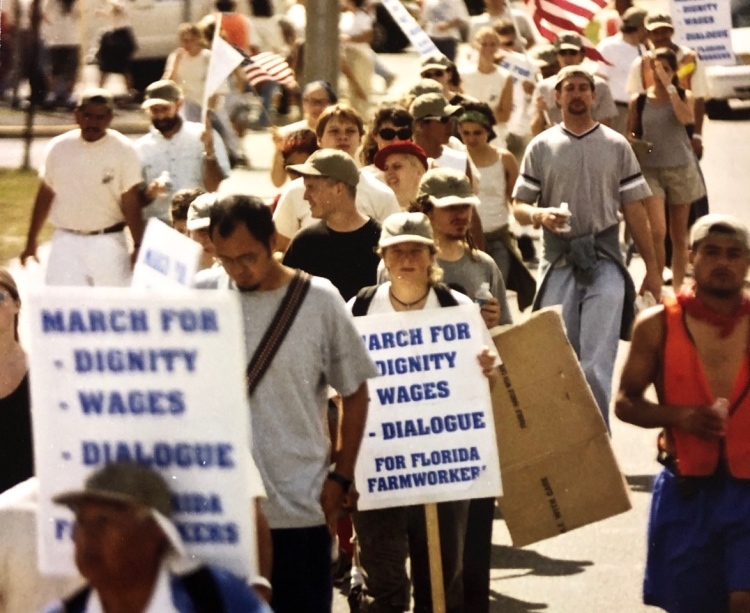 He was with the CIW in 2000, when we marched for two weeks – and 234 miles – across the state of Florida on the March for Dignity, Dialogue, and a Fair Wage (pictured above). He was with the CIW in 2005 when we negotiated our first-ever Fair Food Agreement with Taco Bell, and he was with us for every single Fair Food agreement since that first one, for a total of 14 groundbreaking agreements… and counting. And we are proud to say that on April 24th in Washington, DC, we will be with him when the CIW’s longtime consigliere, Steve Hitov, will be recognized for his untiring dedication – and unparalleled contribution – to the vital work of protecting workers’ fundamental human rights in corporate supply chains. On that day, Steve will receive the first-ever Gwynne Skinner Human Rights Award, presented by the International Corporate Accountability Roundtable (ICAR). If you don’t recognize Steve in the photo at the top of this post, there’s a reason for that: Just as you see him in the photo above, Steve was never the drum major at the front of the CIW’s very public, decades-long struggle. Instead, he has chosen to ply his trade outside the spotlight for more than twenty years, in the background of the CIW’s many marches, strikes, fasts, press conferences, panels and presentations. Yet those who truly know the world of human rights and corporate accountability – and know the awesome power of the Worker-driven Social Responsibility model at the heart of the CIW’s Fair Food Program – know Steve, and cannot but respect the impact of his work over the past several decades in redressing the imbalance of power underlying the extreme poverty and exploitation faced by workers of all kinds at the bottom of global supply chains. And one thing the Human Rights Award Selection Committee at ICAR knows is the world of human rights and corporate accountability! 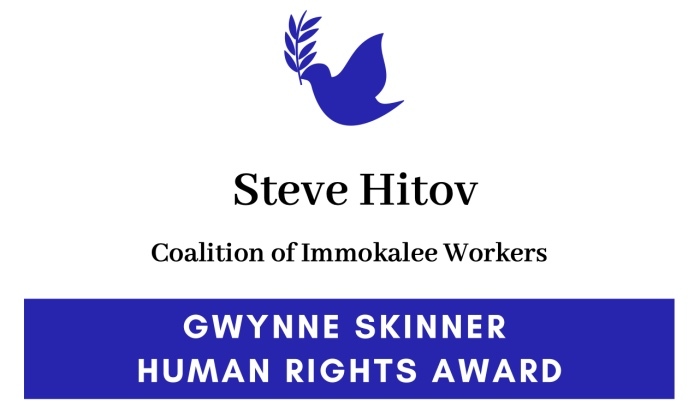 ICAR and the Gwynne Skinner Human Rights Award Selection Committee are pleased to announce the inaugural recipient of the Gwynne Skinner Human Rights Award, Steve Hitov. 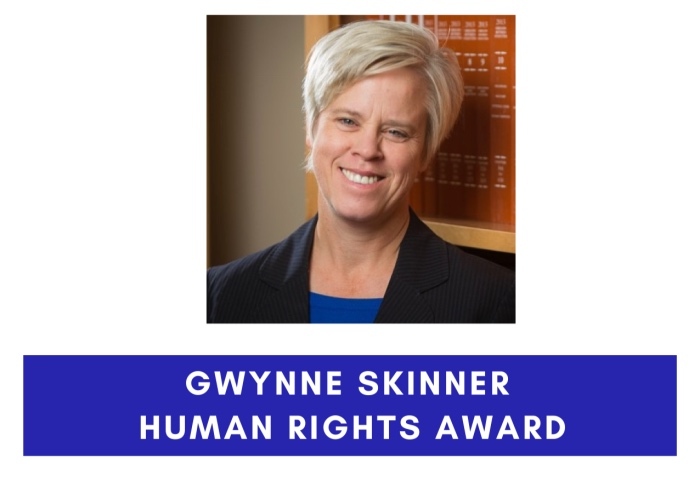 The Gwynne Skinner Human Rights Award recognizes the work of an individual or organization that has made a significant contribution to corporate accountability that year. Steve Hitov has devoted his career to representing low income clients and has served as a staff attorney, managing attorney, and litigation director in legal services programs in New York, Massachusetts, Florida, and Washington, D.C. Through individual client representation, class action litigation, community development work, and legislative support activity on Capitol Hill, Steve has used his legal training to promote social change. Steve has also been active in clinical legal education, having supervised clinical programs and placements at Harvard University, Western New England College, and the University of Maryland. Since 1994, Steve has represented the Coalition of Immokalee Workers (CIW), a human rights organization based in Immokalee, Florida. As General Counsel for the CIW, Steve has negotiated agreements ensuring supply chain accountability with over a dozen of the largest corporate purchasers of produce in the world. He has also negotiated agreements that form the foundation of the Fair Food Program, a unique collaboration among workers, buyers, and growers that works to create a better and more sustainable agricultural industry. Professor Gwynne Skinner was a Professor of Law at Willamette University. Professor Skinner also worked as an ICAR Advisor for over six years, serving as a resource, guide, mentor, and friend to the ICAR community. Her work litigating on the front lines of corporate accountability, producing scholarship, and thought-leadership on access to remedy, parent company accountability, and a range of other issues put her at the forefront of the agenda on business and human rights. Congratulations, Steve, rare is the award that has been more deserved than this.